Ask any 100 contemporary jazz trumpeters to name their chief influences, and it’s a good bet over 90 will mention the same two legendary words: Miles Davis. 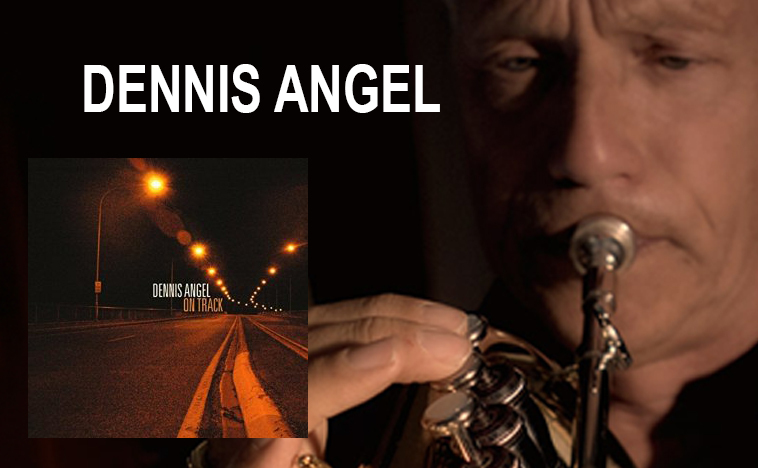 Dennis Angel, rapidly emerging in the genre as an independent and versatile force on trumpet and flugelhorn with a number of radio chart hits – including “Soul Strut,” the debut single from his new full length set On Track - can take that connection even further. During his high school years on Long Island, Angel’s teacher was the world renowned William Vacchiano, first chair of the New York Philharmonic who also gave lessons (at the same time!) to the legendary icon – and later taught future jazz great Wynton Marsalis. Vacchiano was disappointed that Angel didn’t go on to study music at Julliard – but his former student- now a prominent New York based entertainment and copyright trademark lawyer - is making up for lost time in a big way, staying in the pocket on his stylistically eclectic new full length collection after making a huge splash in 2012 with his critically acclaimed debut Timeless Grooves. Both Timeless Grooves and the new album were produced by Jason Miles, a keyboardist, composer and artist in his own right renowned for his work over the past 30 years with Miles Davis, Luther Vandross, Michael Brecker, Whitney Houston, Grover Washington, Jr., Sting, Ivan Lins, Chaka Khan, Diana Ross, Aretha Franklin, David Sanborn and Michael Jackson. “Soul Strut” is a fast rising sensation on various prominent smooth jazz radio outlets, reaching the Top 35 on the Smoothjazz.com Radar chart, debuting in the Top 50 on SmoothIndieStar.com and gaining spins on the Radio Wave Internet Airplay chart. This follows the exciting airplay success of several tracks from Timeless Grooves. “Rio On My Mind” was #67 on the Groove Jazz Music Top 100 of 2012. “Forever Funk” reached the Top 25 on the Groove Jazz Music Top 30. JazzMonthly: You played trumpet in high school growing up on Long Island. Did you completely put it aside for years as you pursued your ‘straight life’ as a lawyer and family man – or did you ever sneak some licks when no one was looking? DA: I never completely stopped practicing. I have been playing my whole life from the time I was seven. At various times over the years, I would play with my brothers at family functions like weddings and bar mitzvahs, and every once in a while we would get a little group together and play locally near where I live in Scarsdale. Fifteen years ago I started playing Dixieland one night a week at Defemio’s, a Yonkers restaurant that regularly featured jazz performers. JM: Tell me about your musical family life and the first band you had with your brothers? What kind of music did you guys play? I know there’s something in your family’s history about beating out Billy Joel in a best band competition! DA: I come from a very musical family. My father was in the Army based in the Phillipines in World War II and played trumpet in shows when big name performers would play there for the troops. When I was six, he started showing me how to play trumpet. My mother played piano and my younger brother Steve was a drummer and Robert was an accordion player who later switched to electric piano and organ. My brothers and I played together in elementary and high school and our band appeared once on the “Ted Mack Amateur Hour.” I went off to college at St. Lawrence University in upstate New York, and later went to Washington & Lee Law School in Virginia. Their band named 3 ½ took off without me and signed to Cameo Parkway Records. They toured with Herman’s Hermits and I have an old 16 Magazine that shows the groups touring at the time – the Stones, the Beatles and my brothers! They won a Battle of the Bands in New York State and beat out an upstart Billy Joel, who came in second. JM: You had some encouragement from those experiences. Why didn’t you pursue a career as a musician then? DA: I had simultaneous dual interests in history and law as well as music when I was in high school. I read the book “My Life In Court” by a well known trial lawyer named Louis Nizer. I was fascinated by his intellectual property work, and he once won a famous case on music copyright infringement. When I was in high school, we played up in the Catskills and remember one time playing a bar for three hours from 10 p.m. to 1 a.m. and the owner didn’t want to pay because we were supposed to play from midnight to 3. He jus said he thought we wanted to play extra for free. I was furious and realized that musicians were always getting screwed out of money owed to them. I decided I would become a lawyer and a musician and if anyone tried to screw my band, I would sue them! I remember in high school looking over a contract my brothers had been offered that included a two percent rate, and that was ridiculous. During college, they did a show with the Rascals, Lovin’ Spoonful and The Exciters and we were talking to the girl singers from the Exciters, who told us they barely made enough to live on. At the time, pursuing a career as a musician didn’t seem stable enough. JM: When did you finally feel like you had enough time to get more serious about pursuing this second career as a musician and recording artist? DA: I have three daughters and when they were younger it was hard to find much extra time aside from my law practice and home life to focus on music – even though I would play here and there when I had the chance. Once they got older and my second was off to college and I had just one at home – Rebecca, who is now 18 and joins me on the bossa nova version of “Tea For Two” I do on the new album – I had a little more time. I got a group together and one thing led to another. Ironically, that happened in 2008 and when the stock market crashed, the guys in the band suggested I write a song about it. So I wrote this blues tune called “Wall Street Recession Time Blues.” A friend of mine who is a folk singer suggested I send it to her radio promoter and it got airplay on college and folk/Americana stations. I also did a music video for the song which got a lot of hits. In 2009, the Boston Herald did a major write up on me and that inspired me to continue writing and recording and sending out songs. I was told that my song “From Bebop to Hip-Hop” was right for the smooth jazz format, so I did some research and found Cliff and Jason Gorov, top radio promoters in the genre. I have been working with them ever since. JM: Tell me about the formation of The Dennis Angel Band and the charitable element involved? DA: I had been playing with saxophonist Gottfried Stoger since the Wall Street song, and we’ve gone through different players. I had a daughter who died from a brain tumor in 1989, and had been involved over the years in different charities. In 2009, I was approached to put a musical revue together to perform concerts for several non-profits, including the Children’s Brain Tumor Foundation. 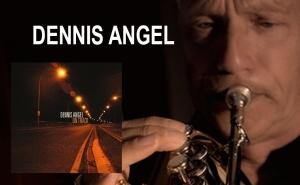 The band I put together for these events, which originally included Gottfried and guitarist Gil Parris, soon became “The Dennis Angel Band.” We performed at many prominent venues, including the Iridium and the Triad in Manhattan and the Watercolor Café in Westchester. These days the band includes Jon Werking on piano, Phil Palombi on bass and Nadav Snir Zelnicker on drums. It’s great working with these guys. JM: What precipitated your decision to work on your 2012 debut Timeless Grooves? DA: This may sound strange to some people, but I thought it might be interesting to meet with a psychic woman in L.A. who was a friend of one of my daughter’s. She gave me some free sessions and instead of just telling me my future, she asked what I really wanted to do. I told her I never really followed up on my trumpet playing or taken it where I wanted to. I didn’t talk to her to have her tell me what I should do, but her words sort of led me to where I think I was naturally going. It also occurred to me that as trumpeters get older, their lips are shot and they can’t play as well anymore. Jason Gorov promoted “From Bebop to Hip-Hop” and I followed up with four more songs and a holiday tune, and he suggested that I do a full album. He hooked me up with Jason Miles and it was a great match. We recorded “Rio on My Mind” on trumpet but Jason thought it might sound better on flugelhorn and so I fell in love with that instrument’s sound and feel. It was the first time I had ever played it. JM: Tell me about the process of making Timeless Grooves – and what did you learn about yourself? DA: It was a very enjoyable process. I had written a few songs featuring vocals and the guys in my band kept encouraging me to write more instrumentals. When Jason Gorov encouraged me with some of them, I brought them to Jason Miles and we went to work developing them. It was kind of intense at first. I was intimated by his background working with legends and knew that Miles Davis had once called him a genius. Jason was tough on me in that first session, but it was worth it. The song came out well and this launched a nice friendship and working relationship. He has very high standards and brought in amazing musicians to play on my songs. He also encouraged me to write more. My musical experiences up to this point were related to playing the trumpet and private lessons. So I learned a lot about developing compositions and producing them. I would write out the melodies and Jason and others would embellish them and add space where it made the songs better. Everything started with my catchy melodies but they added necessary depth to them. JM: Some people who have successful non-musical careers do one album, get it out of your system and move on. What inspired you to stay in the game and record On Track? What is the significance of the name? DA: That happens because of the reality of being an independent artist in this business, where it’s tough to make a profit on even outstanding recordings. But for me, I received enough encouragement from my first album that it made sense to commit to this new career. I am so encouraged by the positive reviews. One writer said, “You know that expression, ‘Don’t quit your day job?’ That doesn’t apply to Dennis Angel.” And I also love the fact that people are appreciating Rebecca’s contributions. She’s a jazz vocal major at Ithaca College and it was a pleasure to record with her and have her perform recently with me at this great new club in the East Village called Café Noctambulo at Pangea. I came up with even better songs for On Track. I figured I learned a lot from the first album so this one would be even better. This time, unlike before, I worked with Jason Miles from beginning to end, starting every song from scratch. I feel like this is more of a concept album. My wife came up with the title, which speaks for itself. We’re going in the direction where we want to go – and that I’ve dreamed of all my life.